Pick Analysis: Only player in FBS history with 1,800 yards rushing and 500 yards receiving in a single season. Tied for second in school history with 50 career rushing touchdowns. Set school records in rushing yards and touchdowns. In 2014, named third-team AP All-American and first-team All-Mountain West. In 2013, named first-team All-Mountain West. Played in 11 games in 2012 averaging 6.68 yards per rush. Was a redshirt in 2011. In high school, named second-team All-State rushing for over 2,000 yards and 35 touchdowns as a senior. Tore ACL during his 2011 redshirt season. Arrested in 2011 for stealing sweatpants and struggled to get out of coach's doghouse. Born in England. Published: May 2, 2015 at 02:34 p.m. The "NFL Draft" crew breaks down the Miami Dolphins selection of Boise State running back Jay Ajayi with the 149th pick. Published: Jan. 6, 2015 at 03:00 a.m.
NFL Media's Colleen Wolfe goes social in a running back battle. Published: March 11, 2015 at 12:29 p.m.
Watch Boise State RB Jay Ajayi work out at the 2015 NFL Scouting Combine. 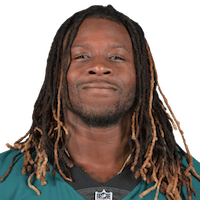 Published: Feb. 19, 2015 at 05:51 p.m.
Former Boise State running back Jay Ajayi talks about his playing style, what teams can expect if they draft him and reveals one thing fans might not know about him.